A single wish will spark a new dawn. Every millennium, the missing pieces of the Scroll of a Thousand Prayers are hunted, for they hold the power to call the great Kami Dragon and ask for any one wish. As a temple burns to the ground Yumeko escapes with its greatest treasure - the first piece of the scroll. 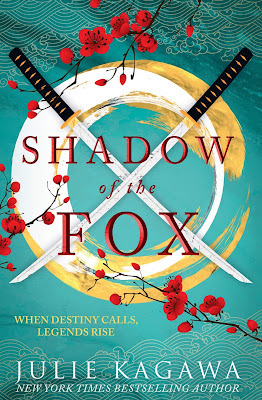 And when fate thrusts her into the path of a mysterious samurai, she knows he seeks what she has. Kage is under orders to kill those who stand in his way but will he be able to complete his mission? Will this be the dawn that sees the dragon wake? Once in every millennium the person who holds the Scroll of a Thousand Prayers has the power to call upon the great Kami Dragon and make one wish. For the safety of the world the Scroll has been torn into pieces and each section is held by a different group of protectors. Yumeko is a young, half-kitsune, girl who has been raised by monks in the Silent Winds temple who secretly guard one of the pieces. When the temple comes under attack by demons she is tasked with the important job of taking the scroll piece to safety. Tatsumi trained from birth as a samurai learning to control a powerful cursed sword so he could become the Kage Demonslayer. He has been tasked with tracking down the pieces of the scroll and told he must to whatever it takes to bring them home to the head of his family. When Tatsumi and Yumeko meet she tricks him into believing she can lead him to the first part of the scroll but what will happen if he realises that she has been carrying the piece with her all along? 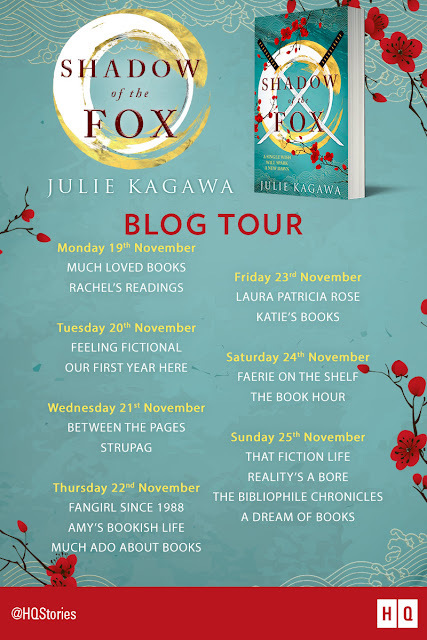 I really enjoyed Shadow of the Fox, its the first instalment in Julie Kagawa's new series and I love how different each of the worlds she creates are. This is a magical world based on Japanese mythology full of all kinds of yokai & kami supernatural creatures, some I recognised and others that were completely new to me. Yumeko and Tatsumi are hunted by demons and monsters at every turn as they travel in search of the hidden temple and you never know quite what will be thrown at the reluctant allies next. Yumeko has had a very sheltered upbringing so she is quite naive and sweet and often far more trusting than she should be but she also has an incredibly mischievous streak and some fun illusion abilities that are going to make her a force to be reckoned with as she grows into her powers. Tatsumi on the other hand is much harder, he's been raised to be a warrior and taught not to trust anyone or let anyone get too close so he's much more aloof and wary than Yumeko. He wields a cursed sword that is possessed by the demon Hakaimono and it takes a lot of willpower to use the sword without letting the demon get inside his own head. As they fight alongside each other during the search for the hidden temple they have to learn to trust each other and what I really enjoyed was that it wasn't always Tatsumi who saved the day, there were times when Yumeko's skills were just as important in keeping them both alive. This is a slow build story with absolutely fantastic world building that takes readers on a journey across a beautifully described fantasy land. I was captivated with this book from the beginning and didn't want to put it down for a minute. I loved both Yumeko and Tatsumi but we also meet some fantastic side characters and I really enjoyed the occasional chapters we got from Sumi's point of view. I have a feeling this series is going to become a firm favourite so I can't wait to get my hands on a copy of Soul of the Sword next year!